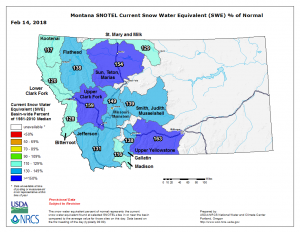 Montana Snow pack map indicates, at this point in time, the Smith River corridor and southwest Montana snow pack evaluations are in good shape as far as snow pack percentages. Storms with additional precipitation are in the forecast and we feel very optimistic about the upcoming fly fishing season. February 23-25: Mike is hosting our booth at The Fly Fishing Show in Pleasanton, California. March 23-24: Look for our booth at The London Fly Fishing Fair. April 22-27: “Fish Like a Guide, But, Live Like a Client” fly fishing school has a few vacancies. This is a great fly fishing vacation package and a great time of year to fly fish in southwest Montana. Contact Mike Geary at 406-459-2030, hwlodgemt@gmail.com, and visit our website at www.hwlodge.com for more information.